Welcome to our guide for fitting an upgraded 52mm Throttle Body to your MGF/TF. If you have a MGF Trophy or a TF160 or 135, you will already have a 52mm throttle body fitted. If you don't have one of these and are thinking about getting one I would highly recommend one. 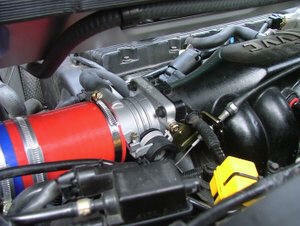 While there is no discernable power gain from this mod there is certainly a great improvement in throttle response. It makes a great partner to most, if not all, of the after market induction kits available for the F/TF. Thanks to Al for letting me (Phil Brindley) loose on his pride and joy for this article. 1 x Flat bladed screwdriver. OK, here we go. This guide was created using a MY2K MGF VVC with a MS Vader induction kit, and as such may very slightly from installation to a standard car. 1. Open boot and remove engine inspection grill. 2. Unclip rear section of roof, unzip rear window and raise rear section. If you have a bungee you can use this to hold the roof out of the way. With the cover out of the way you should have clear access to both sides of the throttle body. 4. Unclip the throttle cable from the gold coloured bracket (a). 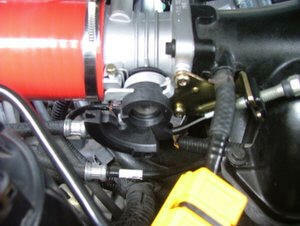 Manually open the throttle body up fully and bring the throttle cable around the black plastic cam. 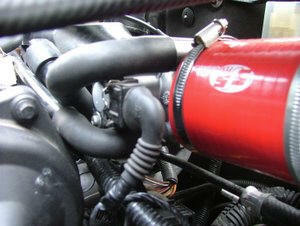 Once free you should be able to slot the cable out of it's housing (b) and free of the throttle body altogether. 6. From the engine bay side, disconnect the 2 rubber breather hoses and the electrical connector. 7. You can now remove the 4 x 8mm bolts holding the throttle body to the plenum. Use whichever of the 8mm ratchet type tools you think fits the application best. I used the ratchet spanner for the top two and the socket and extension for the bottom two. 8. You should now be able to remove the throttle body. 10. Relocate the two breather pipes and the electrical connector to the engine bay side of the TB. 11. Relocate the air filter connector pipe and tighten the jubilee clip. 12. Slot the Throttle cable back into it's housing, open the TB up manually and feed cable around the throttle cam. Clip the cable back into place on the gold bracket. If you notice some slack in the throttle cable you can unclip again from the gold bracket and use the treaded clip to adjust the cable position, obviously the reverse is also applicable if the cable looks to tight. To fine tune you should start the engine and use the engine revs at idle to get the cable tension right. 13. Spend the next 15 mins getting the engine bay cover back on, positioning soundproofing and carpet and generally messing around trying to get the rear of the hood clipped back into place properly (I always hate that bit). 14. Cross your fingers and start the car. If you notice that the car is idling higher that usual once warmed up then you may need to reset the stepper motor. This is done by simply switching the ignition to position II (without the engine running). Depress the throttle pedal fully 5 times in 5 seconds. Switch the ignition to position 0. Start car as normal. If you still find that the car is Idling high you may need to visit your local MG service centre and get the to adjust the TB using a test book. So there you have it. Throttle Body fitting made simple. Check back soon for more "How To's". So from me it's... How, for now! (showing my age there).